Knocknagoum Wind Farm consists of two wind farms in two separate areas; Knocknagoum and Maghanknockane. The substation for the wind farm is located at Reamore, approximately five kilometers from Knocknagoum and Maghanknockane. The wind farm (WF) consists of 15 Vestas V90 3MW wind turbine generators (WTGs) with 9 in the Knocknagoum area and 6 WTGs in Maghanknockane. Knocknagoum and Maghanknockane are connected to the substation by 20kV underground cable which is stepped up to the 38kV system via a 38kV/20kV transformer located at the WF Knocknagoum substation. Knocknagoum 38kV substation is grid connected via the Reamore 110/38kV substation, which consists of a 9 cubicle GIS 38kV switchgear, 2 63MVA 38/110kV step up transformers, 2 AIS 110kV transformer bays, 1 AIS 110kV live bay and all associated control and protection, all designed and constructed under a contestable EBOP contract. 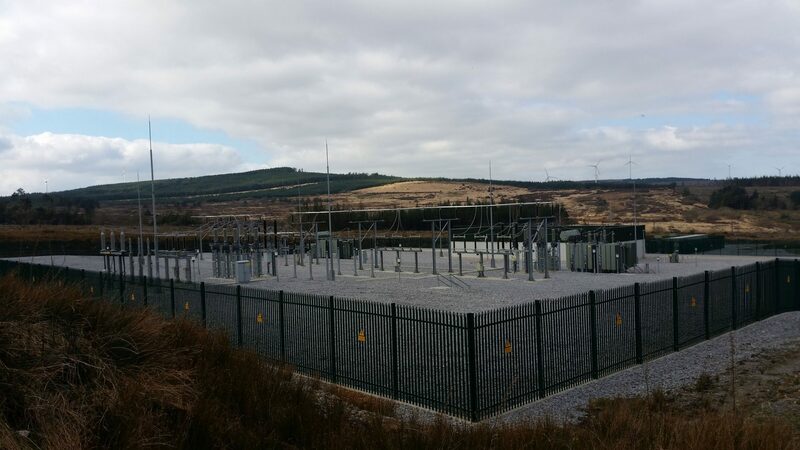 Suir Engineering’s works consisted of all electrical work between the ESB/Eirgrid interface point in the Reamore ESB substation and the termination points of the WTG. Suir Engineering coordinated with the utility company, the turbine supplier and the employer as necessary to ensure the works were designed and installed to meet all applicable requirements for system integrity, safety and operability. In general, Suir Engineering engineered, procured, constructed and commissioned all the electrical works, including earthing systems, within the substation.